The latest Metals release introduces three new in-memory indexes to implement the features "find symbol references" and "fuzzy symbol search". Indexes are important to provide fast response times for user requests but they come at the price of higher memory usage. To keep memory usage low, Metals uses a data structure called bloom filters that implements space-efficient sets. Thanks to bloom filters, the three new indexes added in the last release use only a few megabytes of memory even for large projects with >500k lines of code. In this post, we look into how Metals uses bloom filters for fast indexing with small memory footprint. We explain what bloom filters are and how we can encode problems like fuzzy searching to take advantage of the nice properties of bloom filters. Finally, we evaluate these new features on a real-world project: the Akka build. The work presented in this post was done as part of my job at the Scala Center. the contains(element) method may return false positives, meaning it can occasionally return true even when the element is not a member of the set. when creating a bloom filter, you must provide an estimate for how many elements will be added to the set. A large estimate results in lower false positive rates for the contains(element) method at the cost of higher space usage. Conversely, a low estimate results in lower memory usage at the cost of higher false positives for the contains(element) method. you can't iterate through the elements of a bloom filter. In exchange for these limitations, bloom filters are able to compress a large number of elements into a small number of bits. Due to their space-efficiency, bloom filters are used in many applications ranging from browsers, CDNs and cryptocurrencies. In the next sections, we'll explore how bloom filters can also be used in the context of a language server like Metals. The "find symbol references" feature shows all usages of a given symbol. For example, in the demo below we find 843 references to the method Actor.sender() in the Akka build. Find symbol references is helpful for users when exploring a codebase and it's also an important component for Metals to implement other features down the road such as "rename symbol". The challenge when implementing find references is that large projects have many symbol references. Iterating through all symbol references for every source file on every request is too slow. Most symbols appear only in a few source files so we need some way to reduce the search space. Metals uses bloom filters to reduce the number of files we search when looking for a symbol reference. For every file on disk, we keep an in-memory bloom filter which contains the set of all referenced symbols in that file. When looking for references to a given symbol, we skip files when their accompanying bloom filter does not contain a reference to that symbol. False positive results from the bloom filter are not a problem because they only slow down the response but don't compromise the correctness of the final result. Concretely, Metals keeps an in-memory map where keys are paths to source files in the workspace. The values represent the set of SemanticDB symbols referenced in that file. A nice property of keying the map by file paths is that we can incrementally update the map as files change. When a file is re-compiled producing a new SemanticDB file, we throw out the old bloom filter and compute a new one from scratch. To implement the search, we iterate through all entries of the map and only read SemanticDB files from disk when their accompanying bloom filter contains the query symbol (recap: false positives are OK). In the actual Metals implementation, we additionally take care of adjusting positions of the results in case the source file contents have changed since the SemanticDB file was created. The "fuzzy symbol search" feature allows you to navigate to a symbol definition in the workspace sources or library dependencies by typing the symbol's name. The search is fuzzy, meaning the query doesn't have to be an exact match or a substring match with the target symbol. For example, we want the query ReaSer to match the symbol ReactDOMServer. Additionally, all-lowercase queries are treated as case-insensitive so that searching for nelis matches the symbol NonEmptyList. Like with find symbol references, the challenge when implementing fuzzy symbol search is that we have little time to respond and a lot of symbols to search. Testing the search query against every source file the workspace and every entry in the library classpath is too slow. Metals uses bloom filters to reduce the search space so that we only look at places that are likely to contain matches for the query. We have two different indexes, one for workspace sources and another one for the library classpath. The first index is a map keyed by source files in the workspace. The values of the map is the set of all possible sub-queries that match symbols defined in that source file. For example, consider the code below. For this source file, we insert the following sub-queries into the index. When searching for a query like NoLi, we split the query into the words No and Li and visit only files whose bloom filter contains all of those exact sub-queries. We include trigrams of the uppercase characters to further reduce the search space for queries like NELS that have few lowercase character. For all-lowercase queries, we return the union of results from multiple capitalization combinations in order to support case-insensitive searches. For example, the query neli returns all results matching any of the following queries. To implement the search, we iterate through all entries of the in-memory map and only visit the source files on disk whose bloom filter contain a match for the query. Like with find symbol references, false positive results from the bloom filter slow down the response but don't compromise the correctness of the result. Also, we incrementally update the map as files in the workspace change by removing old entries and compute a new bloom filter for the updated source file. The library classpath index is similar to the workspace sources index except the keys of the map are package symbols (example scala/collection/) instead of file paths. Unlike the workspace sources index, the library classpath index does not need to be incrementally updated when files re-compile. The bloom filters in the values of the map use the same sub-query technique as the bloom filters in the workspace sources index. For each bloom filter, we additionally store a listing of all members of that package. If a query matches a given bloom filter, we test the fuzzy search against all members of the package. Due to how the Language Server Protocol works, the findDefinition method writes sources of library dependencies to disk so the editor can find the symbol definition location. To reduce the number of files written to disk, Metals limits the number of non-exact search results from the library classpath index. In the actual Metals implementation, the listing of package members is GZIP compressed to reduce memory usage and the members are decompressed on-demand when a bloom filter matches the query. We test Metals on the Akka codebase to evaluate the performance of our bloom filter indexes. Akka is a library to build highly concurrent, distributed, and resilient message-driven applications on the JVM. The Akka codebase has 300-600k lines of code depending on whether you include comments and/or Java sources. Metals indexes both Java and Scala sources for fuzzy symbol search but only Scala sources for find symbol references. We open the base directory with Visual Studio Code and update the "Metals Server Properties" setting to -Dmetals.statistics=all to enable additional logging output. We import the build, open the file Actor.scala and wait until compilation has finished. It is normal if this step takes several minutes to complete. First, we measure the response times for find symbol references. Response times range from 8ms up to 1.6s depending on the number of results. The 6103 references to String origin from 913 source files, which is almost half of all Scala source files in the repository. These numbers do not take into account the delay in the editor to display the results in the UI. For large results like String, this delay can be several seconds depending on the editor. Next, we measure the response times for fuzzy symbol search. Response times range from 13ms up to 2s depending on the query and number of results. Queries with typos like ConfigSEr have 0 results and respond instantly, while generic queries like S have ~4k results and take 2 seconds to respond. Observe that all-lowercase queries like actorref are slower than capitalized queries like ActorRef, which is expected because we test multiple capitalization combinations for case-insensitive searches. Next, we look at the memory usage of the bloom filter indexes. The numbers are computed with JOL GraphLayout and the element counts are approximate number of insertions into the bloom filters. The three bloom filter indexes use 8Mb combined for the entire Akka build. The 8Mb include the maps with file/symbol keys and also a GZIP compressed listing of package members for the classpath symbol index. For comparison, the goto definition index that does not use bloom filters requires 16Mb alone. Next, we look at the time it takes to construct the indexes after build import. The Akka build contains many source files but few library dependencies. The bottle-neck appears to be starting the file watcher and parsing all *.scala and *.java sources in the workspace. 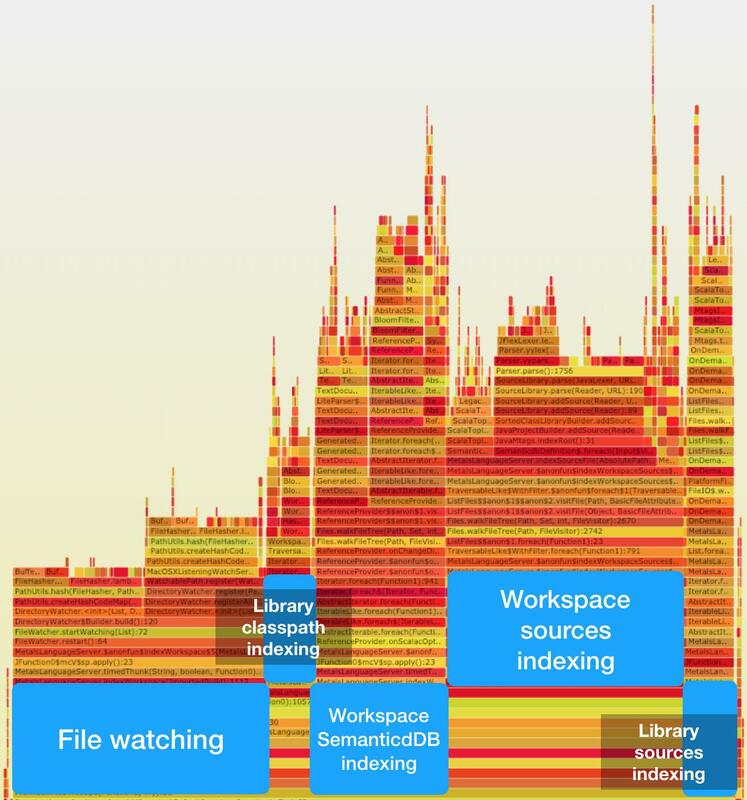 The following flamegraph shows a detailed breakdown of what goes on during indexing. Click on image to interactively explore the flamegraph. it's slower to start the file watcher than compute all three indexes for find symbol references and fuzzy symbol search, combined. the method BloomFilter.put() accounts for 2.26% of the total runtime. 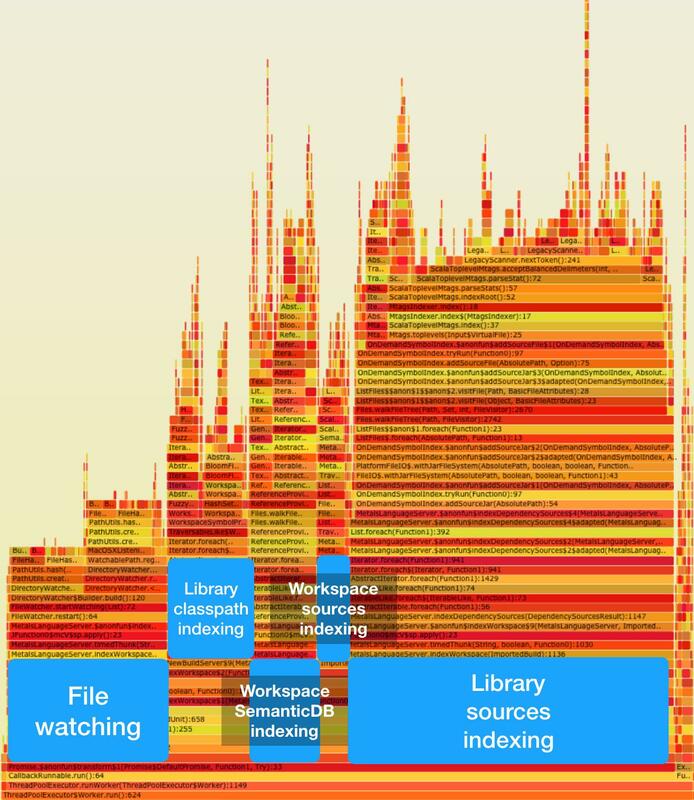 For comparison, below is another flamegraph for the same indexing pipeline but in a different project, Prisma. The total indexing time is around 8 seconds on a cold server for both Akka and Prisma but the distribution is different for how long each indexing task takes. Prisma has fewer sources (80k lines of Scala code, no Java) and a larger number of library dependencies compared to Akka. Computing the bloom filter indexes for find symbol references and fuzzy symbol search takes proportionally even less time in Prisma compared to Akka. The Prisma project is a good representation for projects with less than 100k lines of code and a large number of library dependencies. Metals uses three bloom filter indexes to implement the features "find symbol references" and "fuzzy symbol search". On a case study project containing 600k lines of code, all three indexes use 8Mb of memory combined and enable sub-second response times for most user requests. Response times for fuzzy symbol search is occasionally slower for short queries like S but this limitation is not inherent with the bloom filter indexing approach and may be addressed in future releases. Computing the bloom filter indexes takes 4s in our case-study project, out of total 16s for the combined "import build" and "indexing" steps. These steps run whenever Metals starts in an existing project or after the build changes. Can indexing be made faster? Probably yes, but the user experience will still remain bottle-necked by sbt build export and compilation of workspace sources, which frequently take many minutes to complete on large projects. The indexes are in-memory maps where the keys are file paths and values are bloom filters. When files change, we can incrementally update the indexes by computing a new bloom filter for the updated source file. The bloom filter indexes are only used to narrow down the search space by eliminating files and packages that don't contain relevant results for the user query. False positive results slow down response times but don't compromise the correctness of the final result. Try out Metals today with VS Code, Atom, Vim, Sublime Text or Emacs using the installation instructions here https://scalameta.org/metals/docs/editors/overview.html.